I made these illustrations for stories I told my son Paul when he was about five years old. Not just stories, but factoids, novel and movie plot. He wanted it all. If the illustrations seem random, it’s because I left the subject matter up to him: “You tell me what you want in the picture, and I’ll put it in.” Waterproof ink and watercolor on watercolor paper. I wish I could show them in a higher resolution. Paul grew up wanting to be Dracula, and I was to be his Renfield. 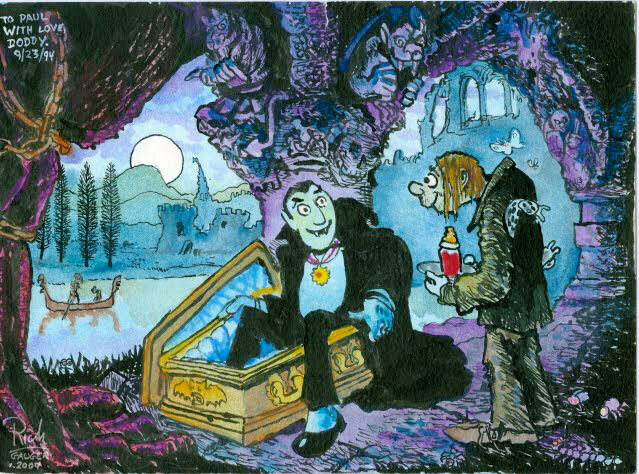 Here’s Renfield bringing Dracula his morning bottle of tomato juice. He wanted slugs in the picture, so that’s them crawling on Renfield. I told Paul about all the versions of The Mummy I had seen, from Boris Karloff through Hammer Films. So he wanted Indiana Jones, an ancient tomb, giant statuary, lots of scorpions, and a mummy his size with a hole blown through it. There was also a modern Egyptian boy who guided tourists though the supernatural. Both of us were ready for the 21st Century CG version! This is me, showing Paul the proper way to summon, and protect himself against, a demon. It takes a lot of book learning, I told him. And never, never read out loud in the occult section of the school library. The wizard’s cape is a shower curtain we had in our bathroom. Cartooning has always been daydreaming on paper for me. Now that I’m older and can’t get out as much as I like, it’s a kind of wish-fulfillment. This cartoon, however is a somewhat fictionalized version of something that actually happened to me in 2008. I quietly paddled up to a buoy where there was a female sea lion sleeping. I got too close to her (in front, not from behind as I show here) I was foolishly within touching distance of her when she woke up. I thought she was going to jump into my kayak! I beat a hasty retreat. I forgot to take any photos, except the one below, which I took as she was seeing me off. She nervously grooms her rear flipper. The blue suit I have on is a Gore-Tex dry suit, essential for safety in the cold Northwestern sea water.